For this year, each week we will hear from different women talking about cycling. 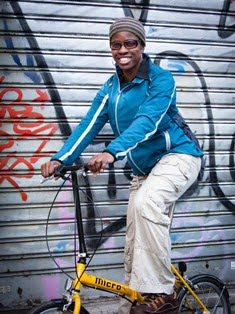 They will be women who ride a lot, a little, for leisure, competitively, who just go to the shops or to work by bike. Some may work in cycling but don't ride, some may just like watching cycling, and others might be cycling wives, girlfriends or widows who can't stand cycling! Whatever, 52 Cycling Voices will be about women giving their thoughts on bike riding. This week the person in the spotlight is yours truly. "I've been cycling on an off since the age of seven, when my dad decided that I had to take my stabilisers off (much to my chagrin!). I then got a second-hand Raleigh 14 which I loved, even if I had a few spills on it. Back then I really hoped I could get a Raleigh Grifter like the cool kids in my class, but that never happened so I stuck with the kiddies' Raleigh 14. When I was a little older I shared a bike with one of my sisters, though she hardly rode it and I rode it a lot - mainly to go to the shops and run errands. It hadn't been long since I passed my cycling proficiency test, so I always found it exciting to get out on my bike and go somewhere. One day we were invited to take part in an 11-mile cycle ride organised by the local church youth group and I had hoped to go on the ride. But my parents didn't allow me to go because I had had knee problems and they thought that the distance would be much too far, so ironically, my sister who hardly cycled went instead! She never said much about the experience so I'm not sure she enjoyed it. After that I never did that much cycling until when I was at university. I got a holiday job in a packing factory to save up money to get a cheap mountain bike. The make was Falcon and I remember travelling up to their factory in a nearby town called Brigg, which was like the big city for me, considering I was just living in a small village on the Lincolnshire/South Yorkshire border. The bike was my pride and joy and I used it a lot, particularly in my second year at university, when I lived off-campus, and would do the eight-mile ride to get to lectures. I also went on a few trips with it during the holidays - to the Peak District, the Lake District, the Mendips and the Malvern Hills - much to the worry of my mother, and the anger of my dad who both kept thinking I was trying to get myself killed! There have been long gaps when I hardly cycled since those days, but cycling has been a continuous part of my life since 1999 when I had to become a regular/committed cyclist in order to get through triathlons. That was a big step for me because it was only then that I rode a "racing bike" with dropped handlebars for the first time, and also had to deal with cleats where my feet were clipped into the pedals. I am grateful to the motorists who were sympathetic towards me during those dicey moments when I had to lean on their cars to avoid crashing because the bike stopped but I still had my feet clipped into the pedals! I ride an old De Ver road bike that was built by Maurice Burton, the former professional racing cyclist who owns the De Ver shop in Streatham, South London. It's not the only bike I have, but it's my favourite because it was my first ever road bike. Lately, I've been riding a nice Boardman women's road bike, kindly provided by Halfords, and Raleigh provided me with a Mustang Sport Gravel bike, which I have also been enjoying testing. For me, cycling is just part of my daily bread like other constants in my life such as running, writing and crochet. Cycling means freedom to get from A to B without being in the lap of Transport for London, or being held to ransom by Southern Rail and their industrial disputes. Technical problems on a bike are infrequent and easy to resolve, and when riding I get to see places from a different angle to when I am zooming by in a car or on a train. Cycling allows me to see the fabric of a country or a region that bit more intricately than if I just went on a bog-standard trip or package holiday. It has certainly allowed me to see some nice places around Europe and beyond. Furthermore, being a cyclist I feel like I am part of a community and it's great to see other kindred souls on the road - whether it's when commuting to work by bike, struggling up a 2-hour long arduous climb in the Alps or seeing others who are equally mad as me rattling our bones across the South Downs on a rigid cyclocross bike! For all the places that I have ridden my bike, I must say that my favourite bike ride is just riding around the various neighbourhoods and touristic parts of London when there's no traffic. London is my favourite city in the world (closely followed by Paris) and I just like to ride and take in the sites of this great city on a sunny day. I did that recently on Christmas day and usually do this whenever I am in London at Christmas. It's also nice to do the Ride London FreeCycle event where Central London is completely closed to traffic and again you can ride your bike at a leisurely pace with thousands of folks of all ages, shapes, sizes and cultures. Bike riding can be a great leveller and brings out the best in me (at least most of the time!). I can't see myself deciding to stop cycling any time soon!"